WWW, March 2014 - In this extra long chapter, Radio Dubroom returns with a strong selection of DUB and ROOTS. Almost two and a half hour of meditations, drum and bass lines, DUB mixing, everything selected and mixed in a non-stop experience for your listening pleasure. The show starts off with a healthy portion of productions by the excellent Dutch producer Slimmah Sound, carrying the vocals of Kyle Sicarues and Lyrical Benjie. The latter, by the way, has some great web plates on his website of which we also play one ("Because You Don't Know"). Right after the deep DUB by Achille Studio, it's straight forward to a selection of some old and new tunes by UK based Vibronics and Russ D. Both are heavyweight producers and you can tell by merely listening to their works along with such vocalists as the sistren Dayjah and Sena, Kyle Sicarues (again) and Chezidek. Some vocals, many dubs, and you may have noticed the change into Steppers during this portion of the show. Right after the Mad Professor, it's time for a BRAND NEW RELEASE BY STEPPAS RECORDS: ALPHA and OMEGA's THINGS GET HOTTER. A powerful tune indeed, consider that this is just one tune of the great new release. Check it out! Also check out the release by IZYAH DAVIS AND FULLNESS REVIEWED RIGHT HERE AT THE DUBROOM, of which you can hear two vocal and two DUB tracks. Stuff to consider indeed. Some other tracks worth mentioning are Jah Rej's "Return of the Dub Man", a remake of an ancient MP3.com classic and ODG's "DUB Worries" which is a hard hitting steppers with vibes you just cannot miss. 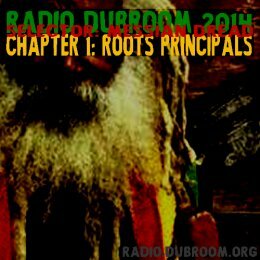 Be sure to get this chapter of Radio Dubroom, preferably play it loud with lots of bass and neighbors that like some crucial Dub and Roots Vibrations.